Broce Brooms now includes NeSilex silica dust suppressant with every sweeper they sell and is offering it to current Broce Broom users through their nation-wide distribution channels. Silica dust exposure has been in the spotlight since the Occupational Safety and Health Administration (OSHA) ramped up regulations and significantly lowered the permissible exposure limits (PEL) for most construction-related activities last fall. With OSHA cracking down on non-compliance and increasing safety concerns, it is more important than ever to find the best silica dust control solution for your construction site. Broce Manufacturing, which has been manufacturing commercial construction sweepers for over 55 years, is taking a proactive approach and leading the sweeping industry in silica dust reduction and safety. Sweeping is an essential part of road construction operations. It is also an activity that produces a lot of dust. 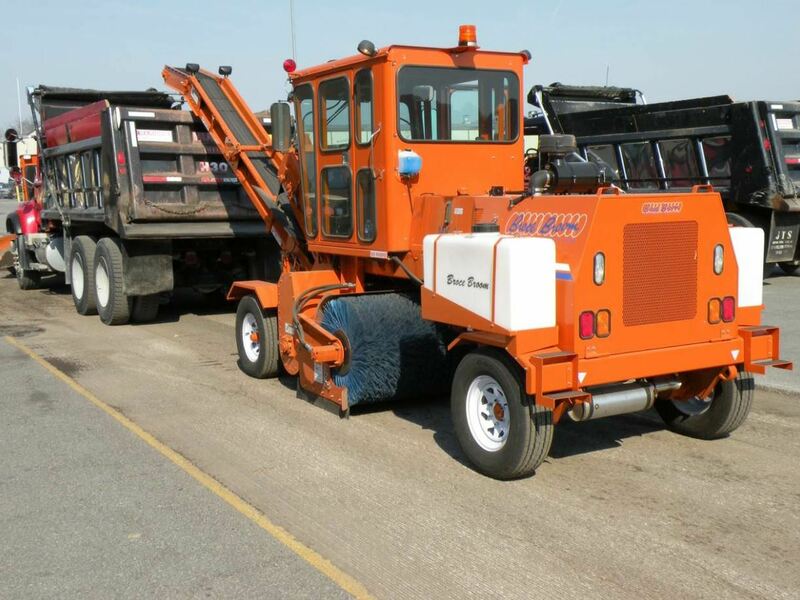 Over the years, Broce has led the way in safety innovations by being the first to include a fully enclosed cab with air conditioning on their sweepers. Today, all Broce sweepers have the ability to be equipped with water spray systems to help reduce dust; however, the new silica regulations have prompted them to offer even more dust control options. Since OSHA updated silica regulations in the fall of 2017, silica monitoring in the field has become a hot topic in the construction industry. As we know now, exposure to silica dust poses serious health and safety threats to workers in a variety of construction-related industries. According to the Centers for Disease Control and Prevention (CDC), approximately 2 million U.S. workers remain potentially exposed to respirable silica dust. Inhaling respirable crystalline silica is extremely dangerous and can greatly increase a worker’s risk of developing silicosis, lung cancer, chronic obstructive pulmonary disease (COPD) or kidney disease. Having a safety plan is essential to workplace operations and OSHA compliance. As of 2017, the PEL for respirable silica dust is 50 micrograms per cubic meter (µg/m³), which is five times less than the previous limit of 250 µg/m³, over an eight hour activity period. To give a visual representation of this figure, imagine standing on a 13 foot ladder in the middle of a football field and dumping a single packet of sweetener into the air—that would be enough material to expose anyone on the entire field to unsafe levels of silica dust. OSHA requires specific housekeeping requirements to ensure safety compliance. These include implementing specific engineering controls to reduce silica dust exposure and having data to show that your preferred method of dust control method is working. Working with an industrial hygienist or obtaining data through third party testing will be necessary to have as a part of your exposure control plan (detailed under OSHA CFR 1926.1153 (g)(1)). OSHA has been expanding the scope of its regulations and cracking down on non-compliance. Within the first six months of the new regulations, there were a reported 116 silica violations. As of June 23, 2018, enforcement is now in effect for the general industry, including manufacturing and maritime. Many sweepers offer enclosed cab options to protect the machine operator; however, that still leaves surrounding workers and civilians at risk of hazardous silica dust inhalation. Under the new OSHA regulations, dry sweeping or brushing is prohibited. At the 2018 World of Asphalt, Broce Manufacturing was on the hunt for a simple, easy-to-implement solution that would enhance the ability of their sweepers to control dust and reduce the potential for silica dust exposure resulting from sweeping operations. At the event, they were introduced to a dust suppressant called NeSilex, manufactured by Chemtek Inc., which enhances water’s ability to control respirable silica dust. Following the World of Asphalt, Broce decided to partner with Chemtek Inc. to supply a method of silica dust control to all of their customers nationwide. Broce is including NeSilex silica dust suppressant with every sweeper they sell and is offering it to current Broce Broom users through their nation-wide distribution channels. Many companies are aware of the new silica dust regulations but are unsure of how to become compliant and improve safety regarding silica dust inhalation on their work sites. By offering an integrated dust control solution specifically in response to the new silica dust regulations, Broce is making the path to safety and compliance easier and more manageable for end-use customers. Continuing to educate the people who have the power to implement safety practices is essential. As part of the partnership, Chemtek Inc., creator and manufacturer of NeSilex, provided third party data showing up to 100 percent decrease in respirable silica dust while using NeSilex. This data, gathered from an industrial hygienist specializing in silica dust, demonstrates NeSilex’s ability to create a safer work site and can be included in exposure control plans.